This doorway is on the northeast corner of the Skylight Antiques building on the corner of 1st Street and Mineral. 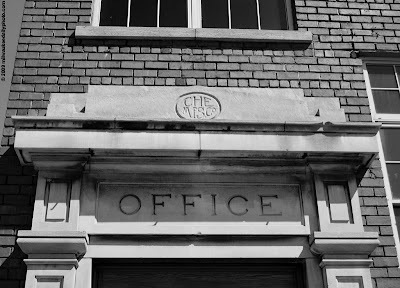 The stonework is a leftover from when the building was an electric motor factory (CH&E was the name of the company). It's great to see this in such relatively good shape and that none of the subsequent building owners decided to remove the signage.